The Chinese-made test maglev train made its debut in the north China port city on Friday, the first of its kind completely designed and made by China itself. 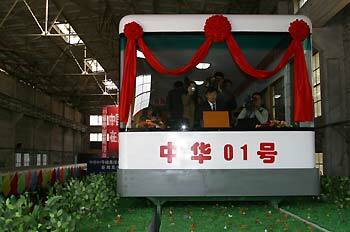 The train, named "Zhonghua 01," is a low-speed train with 32 seats specially made for urban traffic. Li Lingqun, chief scientist of the maglev train study group, said at a press conference Friday that the train is 10.3 meters long, 3.12 meters wide and 2.86 meters high. Its top speed is less than 110 kilometers per hour. The so-called high-speed maglev train, which is levitated and propelled forward by magnetic forces, has become a new focus worldwide for its speed, safety and environment-friendliness. Currently, Germany and Japan lead the world in maglev technology. Compared with the two countries, China's own maglev train features low energy consumption, environment friendliness, high capacity and low cost in both production and operation, said Li. The cost of every kilometer of the track stands at 50 million yuan (6 million US dollars), only one-sixth of the world average. The running cost of "Zhonghua No. 1" is even lower than that of ordinary trains in the country. Chinese researchers have spent 16 years studying the maglev technology applied to "Zhonghua No. 1." The Dalian municipal government is planing to build a 1.5-kilometer-long trial maglev rail line to boost tourism.